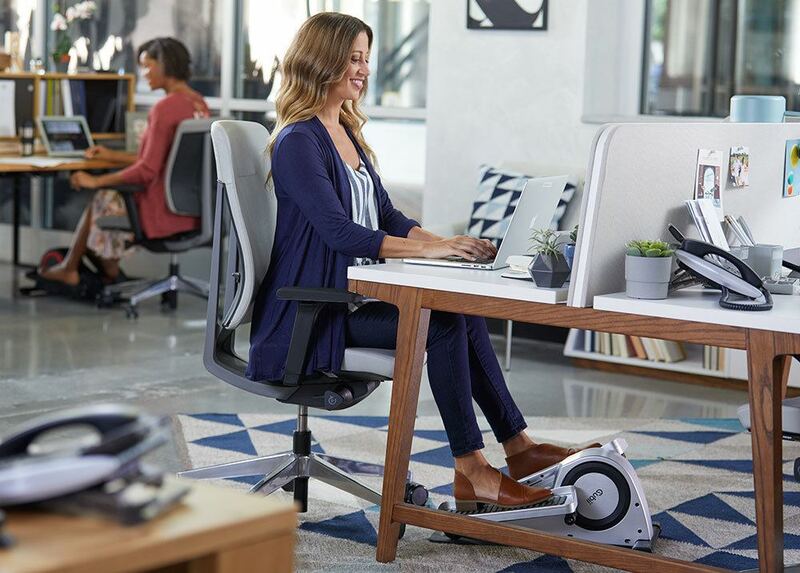 Cubii is the only NEAT® Certified under desk elliptical by the Mayo Clinic for active sitting. 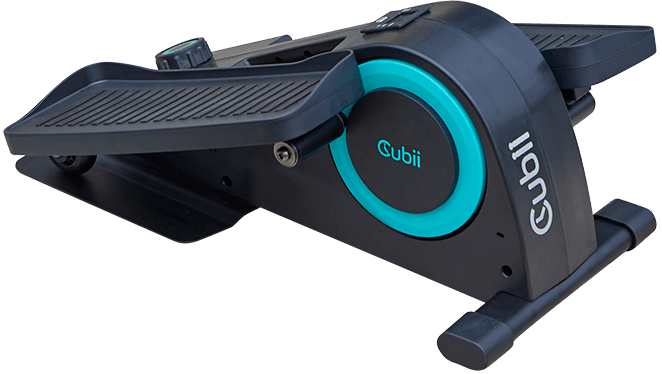 Cubii is perfect for all fitness levels and ages. Stay motivated by connecting to the Cubii app to track your progress over time and compete with fellow Cubii-ers. Syncs with FitBit and Apple HealthKit. Bluetooth feature available on the Cubii Pro. Fitness Cubed is headquartered in Chicago and our Services are provided to you by Fitness Cubed Inc. If you are a resident of the European Union (“EU”), Fitness Cubed Inc. is the controller of your personal data for the purposes of EU data protection law. Aggregate Information. We may aggregate statistical information that does not individually identify you, such as information concerning, such as calories burned, exercise time, distance traveled, weight, height, country, city and organization (“Aggregate Information”). We collect this information directly, such as when you register and indirectly, such as when you use the Service or through our third-party service providers. One type of Aggregate Information we collect is information relating to individual unnamed or identified users, such as calories burned, exercise time, distance traveled, and organization (the “Leaderboard Information”) in order to display such information to other users of the Services on a “Group Leaderboard”. Like all Aggregate Information, Leaderboard Information is not linked to your Personal Information. The Aggregate Information we collect is pooled together to help us improve our Service and to allow users of the Service to gauge their performance vis-à-vis other users.  We use third-party Service Providers in order to efficiently provide our Services to you. Service Providers perform tasks including, but not limited to, fulfillment of orders and credit card payment processing. Some Service Providers, such as credit card processing companies, will collect information directly from you and provide us with relevant data. We may use this information to carry out our obligations and enforce our rights arising from any contracts entered into (for instance, to collect any authorized fees). Information collected from these third-party services is governed by their privacy policies. We allow users to register using Facebook and may allow users to access Twitter, Google+ , and other social media platforms through the Services. We will ask permission to access basic information from that account, such as your name, profile picture, and friend list. You can stop sharing that information with us at any time by removing Fitness Cubed’s access to that account. If you choose to use this feature or if you interact with any other third party on the Services, the third party may have access to your Personal Information, even though we do not disclose your Personal Information for these purposes without your consent. You should view the privacy policies of Service Providers before providing information to them. For users of the Fitbit and Apple Health app, we collect information that will help us offer you additional features. We collect data including but not limited to sleep, activity (e.g. walking, running), weight, heart rate, nutrition, location, and basic profile information. This data is used to provide features and services that help you customize your product experience such as giving you recommendations on frequency of use and time of use and visually displaying your product usage in relation to other data pulled from the Fitbit and Health app. Personally identifiable information will not be shared with third parties. You may opt-out of the service after you set up an account. When you disable your Cubii account or revoke access to your Fitbit and Health app, no further data will be collected; however, we will retain data collected up to the point of revocation. You may contact our customer support team at info@mycubii.com for further instruction on how to remove your data from our database. When you request deletion of your data, we will remove all information that could be used to personally identify you, and these cannot be reinstated. Your Consent: We may share or disclose your Personal Information, at your direction, in connection with your use of the Services. For example when you choose to log in using a third party social media platform (such as Facebook, Twitter or Google+), you are giving your consent to share your Personal Information with that platform. APIs: We may use Application Program Interfaces (API’s) to send or receive information for integration with the Services from third parties, such as Apple HealthKit, Jawbone, Fitbit, MyFitnessPal, Noom, if you have granted such permission to us or to the applicable third party provider. Business Transfers: In the event that Fitness Cubed is involved in a merger, divestiture, restructuring, reorganization, dissolution, or other sale or transfer of some or all of our assets, whether as a going concern or as part of bankruptcy, liquidation, or similar proceeding, your Personal Information held by us may be among the assets transferred. Leaderboard Information. You may elect not to include and display your Aggregate Information in the Leaderboard Information by selecting the applicable option on the Website or App. You may send us an email at info@mycubii.com to request access to, correct, or delete any Personal Information that you have provided to us. We may not accommodate a request to change information if we believe the change would violate any law or legal requirement or cause the information to be incorrect. Access and Porting: You can access much of your information by logging into your account. If you require additional access or download, please contact us at info@mycubii.com. Fitness Cubed support team will respond to your request within 7 business days. Rectify, Restrict, Limit, Delete: You can also request to rectify, restrict, limit or delete your information by contacting info@mycubii.com. Upon requesting to have your data deleted, all data which can be used to personally identify you will be deleted and cannot be reinstated. You can also request to have your account deleted. Fitness Cubed will respond to your request within 3 business days to confirm if you really intended to have your data or account deleted. You must respond with your confirmation within 7 business days. Otherwise, your request will be cancelled automatically and you will need to initiate your request again. After you submit your confirmation, Fitness Cubed will take up to 7 business days to process your request and send you a notice of completion. Object: Where we process your information based on our legitimate interests explained above, or in the public interest, you can object to this processing in certain circumstances. In such cases, we will cease processing your information unless we have compelling legitimate grounds to continue processing or where it is needed for legal reasons. Complain: Should you wish to raise a concern about our use of your information (and without prejudice to any other rights you may have), you have the right to do so with your local supervisory authority. California Civil Code Section §1798.83 permits users that are California residents to request certain information regarding our disclosure of Personal Information to third parties for their direct marketing purposes. To make such a request, please send an email to info@mycubii.com. Our Services are not intended for children under 13 years of age. No one under age 13 may provide any Personal Information on the Website or through the Services. We do not knowingly collect Personal Information from children under 13. If you are under 13, do not use or provide any information on the Service. If we learn we have collected or received Personal Information from a child under 13 without verification of parental consent, we will delete that information. If you believe we might have any information from or about a child under 13, please contact us at info@mycubii.com.